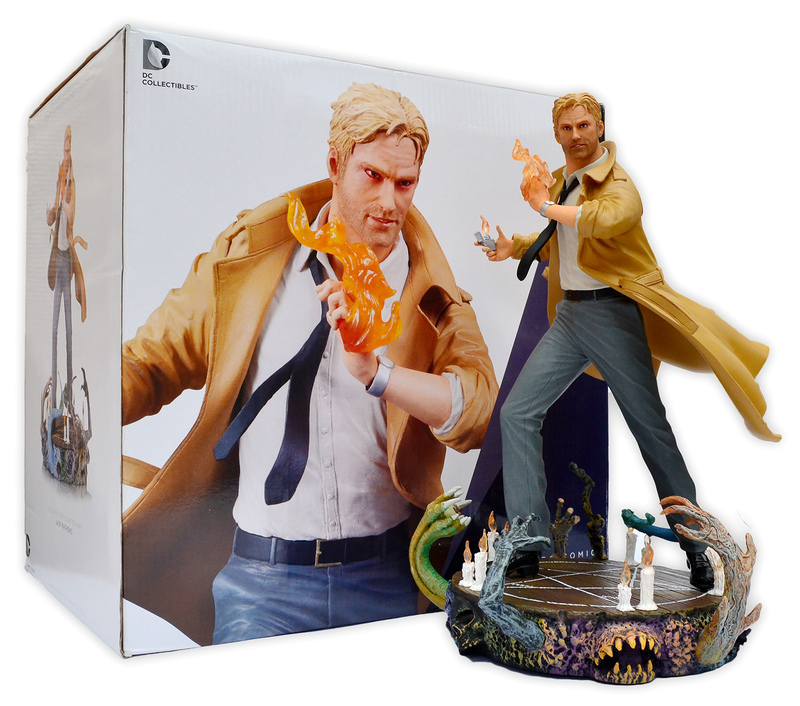 Constantine statue by DC Collectibles | 'TAIN'T THE MEAT… IT'S THE HUMANITY! 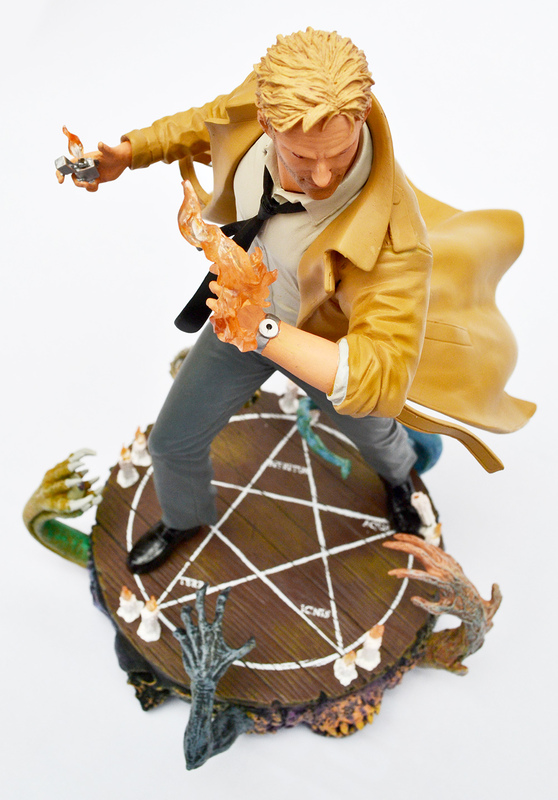 DC Comics’ very own occult detective and Hellblazer John Constantine received DC Collectibles’ statue treatment with this impressive entry from 2015. DC’s supernatural bad boy was created by Alan Moore, Steve Bissette and John Totleben and first saw print in issue #37 of The Saga of The Swamp Thing in June 1985. The snarky magician/con man, who originally bore an uncanny resemblance to Police frontman Sting, was an immediate hit with fans, going on to star in the long-running Hellblazer series published by DC Comics mature imprint Vertigo. That title was folded into the publishers’ New 52 relaunch in 2013 and the character is still in print today. Such is Constantine’s popularity that he has spawned both a movie and TV show, and is scheduled to appear in his own animated series later this year. The cover to Justice League Dark issue #4, artwork by Ryan Sook. Released in October 2015 this cold-cast porcelain statue stands 11 inches tall and was sculptured by Jack Mathews. 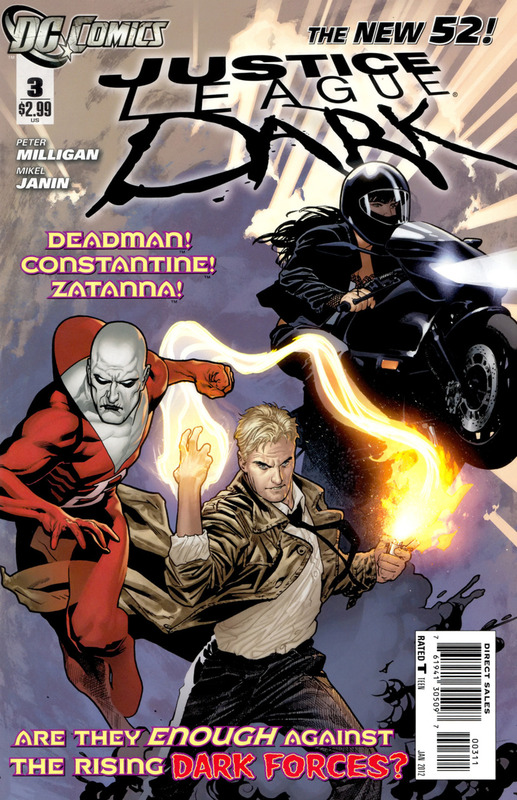 The statue appears to have been inspired by the character’s appearance from DC’s Justice League Dark, and Constantine’s stance, with his flaming hand spell at the ready, is very reminiscent of Ryan Sook’s cover from issue #4 of that title. Mathews’ is no stranger to DC Collectibles and has sculpted several popular pieces for the publisher over the years. 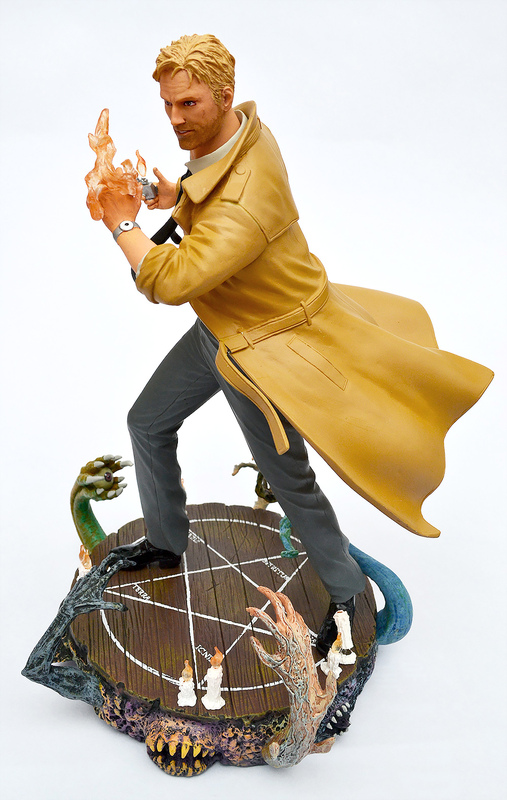 I love the dramatic sweep of Constantine’s trench coat. Mathews’ does a good job on the statue, giving it a terrific sense of action and motion. 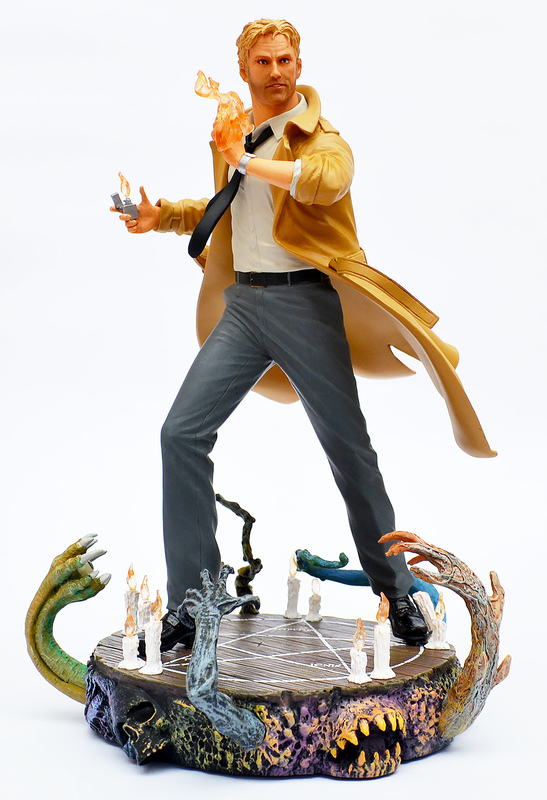 The transparent moulding of the flames on Constantine’s hand is very effective and the detailing of his hair, and the wrinkles in his coat, are very well done. The flame effects are very well done. 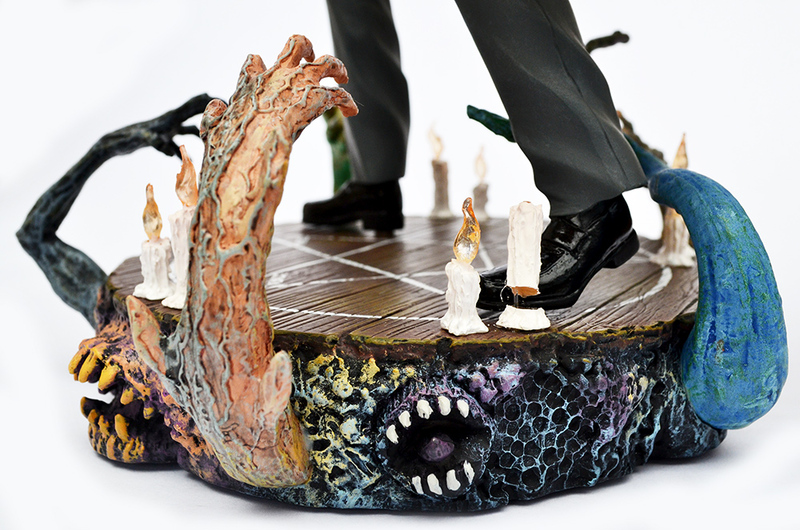 The statue stands on a pentagram base with demon hands reaching up to grab the occult detective. The paint job on the base — as well as the rest of the statue — is very detailed and precise. Even a master of the occult is susceptible to the occasional broken candle. The statue ships in a large cardboard box, and is encased in three thick pieces of polystyrene. However, despite these precautions, a large number of statues were damaged in transit. The main culprit seems to be the fragility of the candles at the base, and eagle-eyed readers will spot the broken candle on this statue too. 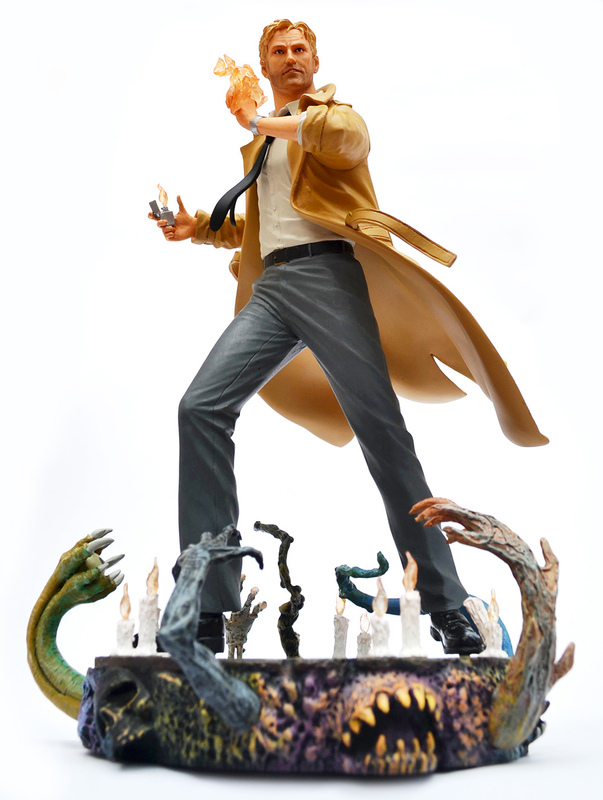 When released the Constantine statue retailed at $125 (£100) but damaged versions can be found for about a third less (I purchased theis statue for just under £70). Potential buyers will need to weigh the merits of paying more for a complete statue, or less for a damaged one (and there do appear to be far more damaged versions available than undamaged). Personally the broken candle doesn’t bother me as it’s at the back of the statue and isn’t really noticeable. The Constantine statue from all sides. This is the fifth DC Collectibles statue I’ve purchased over the last few months (the others featured The Sandman, Batman and Killer Croc, iZOMBIE and The Dark Knight Returns: Superman and Batman) and I’ve been impressed with all of them. The attention to detail has been very impressive, and the paintwork has been faultless. The Constantine statue may not be the most dramatic of my collection (that title goes to Batman and Killer Croc) but it’s a welcome addition to my collection nonetheless.